Herbs and spices are an easy way to transform dishes from edible to delicious, but many of us do get stuck in a rut with salt and pepper, or rely on whoever manufactured our frozen dinner. Who doesn’t have a row of dusty containers that only see the light of day for the annual pumpkin pie? Incorporating new herbs is intimidating. What if it tastes bad? I used to think herbs were for serious chefs who knew what they were doing. The ghost of Julia Child might haunt me if I screwed up. I didn’t venture far beyond basil until I HAD to learn how to cook. I was put on a special diet for health reasons, which forced me to cook most of my meals. I had a strong desire to eat something that smelled and tasted really good, and I knew herbs were the way to go. 1. Use sufficient potent herb. Try 1-2 teaspoons of dried herb for 3-4 cups of cooked food. Buy herbs from stores that frequently replenish stock, and smell bulk herbs to ensure they are still potent. Store herbs in air tight jars away from heat and light, and use within six months of purchase. Herbs with juicy stems such as basil, parsley and cilantro are best used fresh and by the handful. The flavor of herbs are concentrated in their oils. Adding a tablespoon of olive, grape seed or coconut oil releases the flavor of these oils and distribute them throughout the dish. Consider of the sheen of oil on roasted rosemary potatoes, or the initial cooking of butter and herbs when making a soup, sauce or sauté. Add a squeeze of fresh lemon juice to roast chicken, or 1/4 cup of wine to your soup, and suddenly you have a great meal. Throw in some crushed garlic and your friends will pronounce you an “excellent cook.” Add a little at a time, and taste frequently to ensure you add the right amount. 4. Try The Mighty Broil or The Weekly Soup recipes to get started. When you are ready, pick a seasoning from my comprehensive list of herbs and substitute a different seasonings in the recipe. Food preservation has become popular again with the urban gardening movement. There are only so many tomatoes and zucchini you can eat or give away, so why not preserve them and eat them later? Here is a summary of preservation techniques: freezing, fermenting, canning or jam making and dehydration. I presume everyone reading this has used a freezer before. While raw foods don’t always thaw well, (frozen lettuce? Ewww…) frozen spinach tastes a lot like fresh once it’s cooked. If you are freezing fresh produce, wash and dry fruits and vegetables, remove pits and cores, cut large items into 2” pieces and freeze in zip lock bags. Squeeze the bang gently to remove most of the air before you freeze it to reduce freezer burn and ice crystals. Raw meat, soups and wet cooked foods are also ideal for freezing. Write dates on your frozen foods and eat within 3 months for best results. 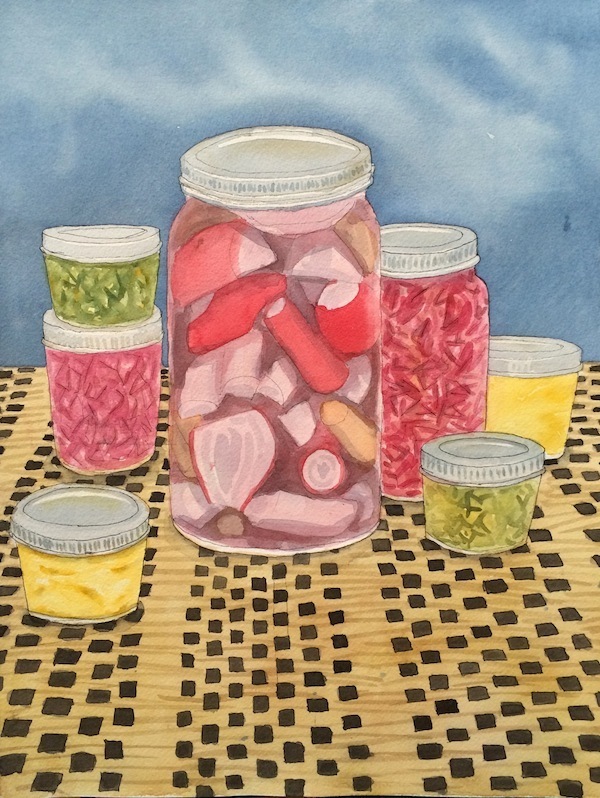 Before we had refrigerators and freezers, everybody ate fermented food. Without refrigeration, fermentation is inevitable. While some bacteria will make you sick, many strains are beneficial and can actually preserve your food. For example, if organic raw milk is left out, the good bacteria in the milk will make lactic acid, which dangerous bacteria can’t abide. This fermented milk is known as clabber, and it was more common than fresh milk back in the day. Many popular foods are fermented. Some examples are sourdough bread, coffee, chocolate, salami, olives, yogurt, cheese, soy sauce, pickles, wine and vinegar. A starter culture of the desired bacteria may be added to the food to ensure it grows, and anti-microbial ingredients such as salt, acid, herbs and spices prevent unwanted strains from taking hold. While the idea of making fermented food may be scary, it is an easy, delicious and useful way to preserve summer produce from the garden. Good bacteria live on the surface of fruits and vegetables, and the fermentation process encourages the growth of these strains. I’m currently in love with preserved Meyer lemons. This Moroccan condiment is simply lemons that are cut in quarters and crammed into a jar with plenty of salt and allowed to ferment for a month. The resulting flavor is tart, salty and complex, and I love to rub it in on chicken before roasting it. Sauerkraut and lacto-fermented pickles follow a similar process, and can include a wide variety of vegetables. Pickles are made from whole or large chunks of vegetables that are allowed to ferment in a salty or vinegar based brine. While most people associate pickles with cucumbers, I prefer firm vegetables such as carrots, radishes and cauliflower. Sauerkraut making is very similar to pickling. Sauerkraut differs in that the vegetables are chopped finely, and is made exclusively with salt, not vinegar. Salt draws the juice out of the chopped vegetables, providing a wet environment for the good bacteria to grow. The good bacteria in salt pickles and sauerkraut protect the vegetables from pathogenic bacteria by producing lactic acid, much like the clabber I mentioned earlier. This acid lends a sour flavor that is familiar to those who enjoy pickles and sauerkraut. 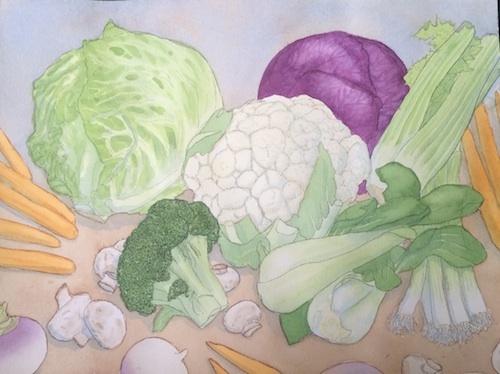 I teach sauerkraut classes every spring and fall at the Albany recreation center, so you can learn for yourself how easy and fun making fermentated vegetables can be. Check my events page for the next available class. If you wish to experiment with a wide range of fermentation techniques, I recommend the book, Wild Fermentation by Sandor Katz. Fruit preservation is an ancient process that was invented in the Middle East thousands of years ago, but modern canning techniques are only about two hundred years old. In the canning process, foods are initially boiled with acid, salt, or sugar to prevent the growth of dangerous bacteria, particularly clostridium botulinum. The food is then carefully stored in a hermetically sealed, sterile containers. While thousands of people have canned food at home safely, I am not a fan of this process for several reasons. 1. Most canned vegetables don’t taste very good. 2. It’s very easy and very dangerous to get it wrong. There are a lot of unsafe canning recipes on the internet. 3. Botulism is lethally poisonous and canned foods which contain clostridium botulinum don’t smell or taste different from safe food. 4. Vitamin C, E and many important B vitamins are destroyed by the long cooking process and extended storage. Freezing, fermenting and dehydration are easier, safer and more nutritious in my opinion. That said, people do love jam and canned fruit. And it’s no wonder, since the main preservative in these foods is sugar. If you wish to lesson the amount of sugar in jam, add lemon juice to increase acidity, which kills bacteria. I recommend careful research and reliable recipes if you wish to attempt canning and jam making on your own. Here is a great article by Homegrown.org that offers tips for safe canning. This preservation technique has been practiced since ancient times in arid climates. Bacteria need water to survive, and dehydration, especially with the addition of salt or sugar, is an easy and safe preservation method. Dried meat and fruit are the most common and traditional dried foods, but kale chips and dehydrated vegetable crackers are new and delicious ways to preserve and enjoy vegetables year round. The ingredients in dehydrated veggie crackers can be varied depending on which crops are in season. This is a boon if your garden is producing more food than you can eat. The most important thing to remember with dehydration is to dry the food a little more than seems necessary. Food that feels dry may still contain traces of moisture, especially if the pieces are soft or flexible. Even the smallest amount of moisture will allow bacteria to grow. The addition of salt, garlic and other anti-microbial herbs like thyme provides flavor and additional protection from bacteria. It’s fascinating that people have been drying, fermenting food and making jam food centuries before Louis Pasteur, the microbiology pioneer, who began his studies in the mid-1800’s. I hope this knowledge will give you courage to try some of these techniques yourself. The processes are simple if you follow the correct procedures. Take a class, read a book, test a recipe at home and the results will delight you. I love doing projects with other people. My art and cooking classes are basically an excuse to hang out with people and make stuff. Naturally most of my friends are cooking/art/project junkies as well. 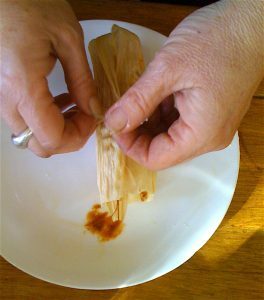 One of our favorite classes to teach is how to make tamales. I’m fortunate to have a Mexican market in my neighborhood that sells 5 lb. 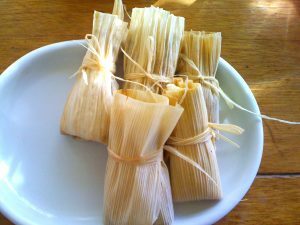 bags of tamale masa (cornmeal) and corn husks. Besides the fun of hanging out, it’s fun to see all the random fillings people bring. 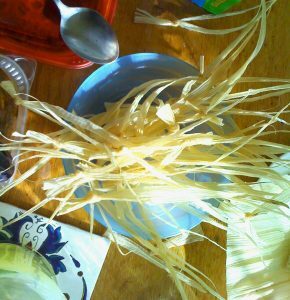 It all starts with soaking the corn husks in water, and making strips to tie our tamales closed. 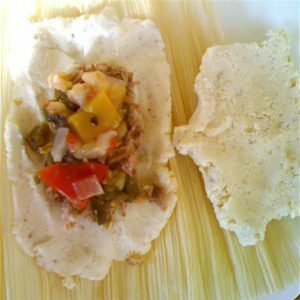 Once this is done, you can spread a little masa on your corn husk and fill it with whatever you want. Careful not to make them too big, they puff up when you cook them! 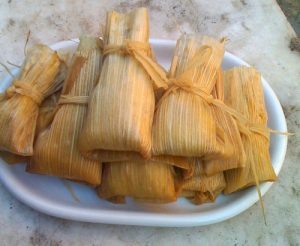 Now wrap the husk around your tamale like a little corn package of joy and tie it closed with the strips you prepared earlier. It’s easy to get a nice pile going when everyone is working together. Soon you have enough to put in the steamer. It takes a big pot to steam a mess of tamales. Once they are all done we divided them up. Don’t worry about who made which ones, just take a bunch and enjoy a surprise every time you eat one. I froze half of mine and reheated them in the microwave. Sadly they are all gone now. I wish I could eat you guys all over again! Anyone who has roasted a turkey before knows what a challenge this process can be without few special tricks. While a traditional, breast up, whole bird makes a beautiful image, the result can have dry, overcooked white meat, undercooked dark meat and a ridiculously long cooking time. Here is a quick look at the problem and tips for a delicious turkey. A hot oven is basically a hot dehydrator. The longer the cooking time, the more water will evaporate and the drier the meat will be. Turkeys are big birds, and most need four hours or more for the whole bird to reach a safe temperature of 180 degrees Fahrenheit. While it is helpful to research cooking times in advance, a meat thermometer is the best way to ensure your meat is fully cooked. Be sure to test the upper thigh, inserting the thermometer at an angle, carefully avoiding contact with bone. The breast is especially prone to drying out since it is low fat, and it is traditionally cooked facing upwards, allowing hot air to dry it out. Gravity pulls moisture downward towards the bonier, slower cooking legs. What you get is overcooked, dry white meat, and undercooked dark meat. This is why it is important to slather the whole bird thoroughly with a mixture of butter and poultry seasoning before putting it in the oven, and many cooks prefer to roast the turkey breast down. My mother, who cooks meat better than anyone I know, has decided that it is preferable to cook turkey in pieces rather than a whole bird. Cooks Illustrated agrees with her, and even gives advice on how to disassemble a bird. While turkey parts don’t have the same visual impact as a whole bird, the advantages outweigh the less glamorous presentation. You can cook as much or as little meat as you want. If your grocery store offers a good selection, you can chose only the cuts your family loves most. You no longer have to over cook the breast to get perfectly cooked dark meat. Remove the pieces from the oven as they finish cooking. Test for doneness with a meat thermometer. Brining is a popular way to ensure delicious, tender meat. 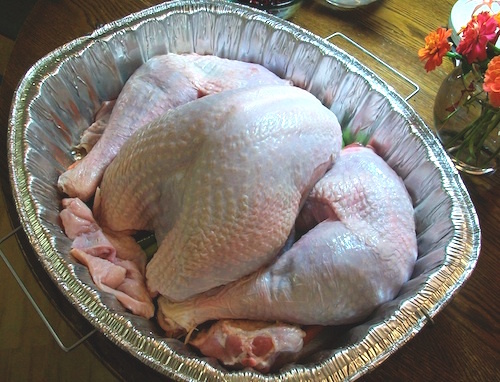 It is much easier to fit pieces in a brining solution than a whole bird. Pieces can be easily arranged in pot if you choose to braise your bird. This is my mother’s preferred method. I hope your turkey is delicious, and you have a wonderful Thanksgiving with your loved ones. This is my lazy solution to making pie when summer fruit is in season. 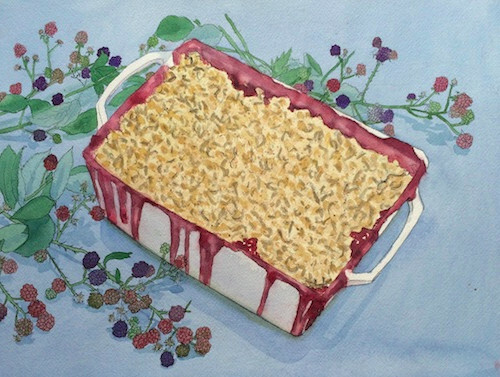 It’s always a hit with my Teen Cooking Summer Camp because it involves chopping several pounds of fruit (kids love to chop) and everyone get to take home their own dessert-filled aluminum tin. Yield: This recipe will fill a large 12” wide casserole dish. Taste and examine the fruit before putting it in the crisp. You may want to increase or reduce the amount of sugar depending on the sweetness. If the fruit is very juicy, add 1-2 apples, which are high in pectin and will make the filling firmer. You can also mix 1-2 tablespoons of cornstarch to chopped fruit thicken the juice. Low-acid, bland fruit like white peaches or blueberries benefit from a tablespoon or two of lemon juice for contrast. Place chopped fruit with sweetener and cinnamon in a bowl and toss with your hands until mixed. Melt butter in a small pan on the stove or in a cup in the microwave for 1 minute or until liquid. In the second bowl, place oats, flour, sugar, butter, cinnamon and salt and mix with a big spoon. Scoop all of the fruit filling into a baking dish, pressing it down to create a somewhat flat surface. Sprinkle topping evenly onto the fruit, mounding it over any sparse areas. This recipe makes a generous amount of topping, which prevents the fruit from drying out. Place parchment paper on a baking sheet and place the dish on top to catch any juice that may bubble over. Let the crisp bake for at least an hour and 20 minutes. Check to see if there is any bubbling juice around the edges of the container. This is a sign that the fruit has cooked down and become a juicy, soft filling and is ready to eat. Let the crisp cool for at least 20 minutes before serving. Molten filling very hot when it first comes out of the oven. I’ve practiced and revised this recipe more times that I care to count, but we love this final version and I make them frequently. This recipe that doesn’t rely on xanthan gum, tapioca starch or other weird ingredients to make a satisfying, fluffy pancake. Rice flour makes up the bulk of the pancakes, the protein in the eggs hold it together, coconut oil makes them rich and tender and baking powder helps them to rise. Salt, cinnamon and vanilla adds to the flavor, and I love the texture of the flax seeds. 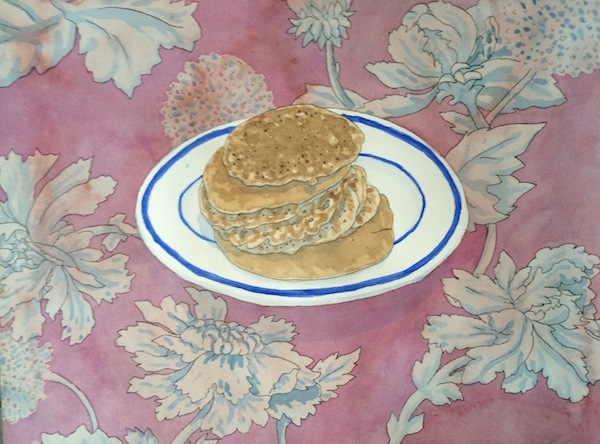 While you could use water, nut or rice milk make a tastier, more tender pancake. Combine dry ingredients in the large bowl, and mix thoroughly with a whisk. In a small bowl combine the wet ingredients and whisk until eggs are completely incorporated with the other ingredients. Pour the wet ingredients into the large dry bowl and mix with a large spoon until they are fully incorporated. Put the pans on medium heat on the stove and place a teaspoon of coconut oil on each pan. Spread the oil around with a spatula or by tipping the pan. Test how hot the pan is by dripping some water on the pan. The pan will sizzle when it is hot enough to cook the pancakes. Scoop a large spoonful of batter and pour a 4-6” pancake on the pan. You may use a ladle if the bowl of your large spoon is shallow. The pancake is ready to flip when the edges become slightly matte and bubbles form. This will only take 30 seconds to a minute. The higher the heat, and the smaller or thinner the pancake, the faster it will cook. I often adjust the heat as I cook, turning it down if the pan begins to smoke, or up a little if the pancakes take too long to brown. Cook the pancake for 5 seconds on the second side or until slightly brown. Place the cooked pancake on a plate and pour more batter on the pan. It can take a long time to cook a big batch of pancakes one at a time. To speed the process, cook pancakes on several pans at once, or if you have a pan is at least 10” in diameter, pour three 2″ pancakes in a triad close to the center of the pan where it is hottest. If they run together, cut them apart with the tip of the spatula before you flip them. My husband likes to eat pancakes plain, but I enjoy them with a little jam or with sliced fruit and maple syrup. 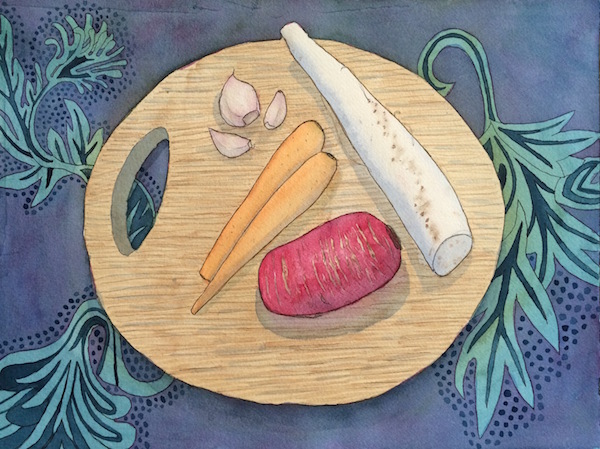 This is a great recipe for root vegetables. Peel rutabagas, turnips with tough skins before broiling. Chef’s knife; cutting board; large bowl; measuring spoons; garlic press; baking sheet; parchment paper; metal spatula. Preheat broiler to low or 500 degrees F.
Place sliced vegetables, meat or tofu in a large bowl and add olive oil, seasonings, garlic and salt. Toss ingredients with your hands until the pieces are evenly coated. Cover a baking sheet with parchment paper and place food in a single layer. Put the sheet in the broiler and set a timer for 10 minutes. The pieces of food will be slightly brown when they are ready to eat. 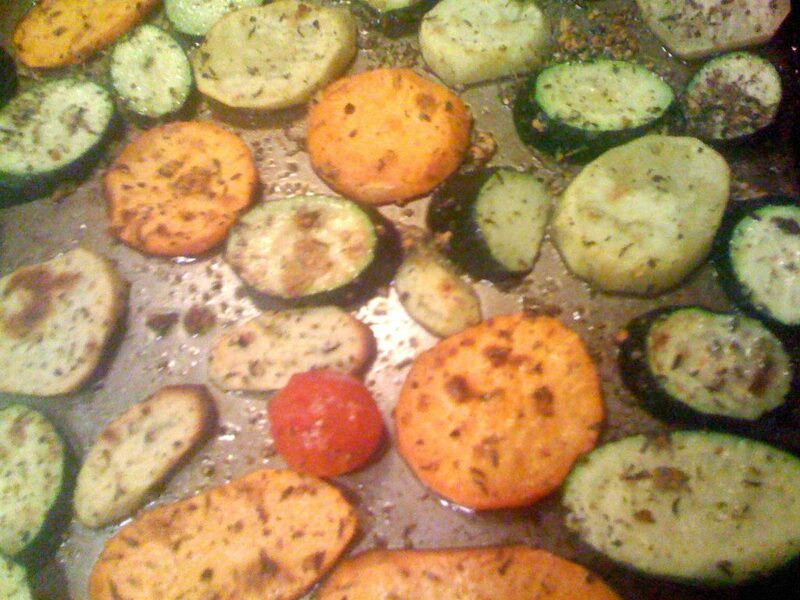 Substitute the vegetables with carrots, zucchini, summer squash, winter squash, parsnips or white potato. Green beans and asparagus can also be broiled whole, but may cook before the other ingredients are done. Check the oven after 8 minutes and remove them from the pan when they are done. Finish cooking the remaining ingredients as needed. Substitute the spices with Italian seasoning, curry powder or other favorite seasoning blends. This soup consists of whatever needs to be used up in the refrigerator- the nearly forgotten onion half, the leafy center core of celery and those carrots that have become flexible but haven’t changed color yet. You can also add leftovers from previous meals such as cooked meat, vegetables and cooked grain. If you are new to cooking or need a more inspiring way to prepare vegetables, this is a good one to do regularly. This meal may old hat for regular cooks- people have been making soup with leftovers since the dawn of time; however I hope I can offer some new ideas as well. 1. Go through your refrigerator every week or two and throw out whatever is clearly over the hill. 2. Examine what is left and put together a combination of ingredients that would make a decent soup. It’s okay to purchase additional ingredients like onion or garlic to ensure your soup really sings. 3. Chop ingredients and put them in a pot of broth or water and let simmer until cooked. Add a little salt and acid such as lemon juice or vinegar to taste and enjoy. Be honest about which vegetables are still good candidates for the soup. It’s fine if they are little flexible, but anything that looks faded, wrinkled or discolored should be thrown out. Use a 2-quart or larger sized pot to cook the soup, and have some wide-mouth, freezable containers with lids to store leftovers. This soup is a life saver for when you don’t have time to cook. Chop about ½ cup of each vegetable to into bite sized pieces if you want a balanced soup that is easy to eat. Buy pre-cut vegetables if you hate to chop. A cup or more of one ingredient will make it the main focus of the soup. Think about how it will taste and whether you still have enough room in the pot for other ingredients you wish to add. Limit yourself to 3-6 different types of vegetables. Try not to use more than two starchy ingredients, such as drained canned beans (not refried), potatoes, yams or corn. Rice and pasta also count as starchy ingredients. Onion, celery and carrots are a classic combination and mild vegetables like green beans, potatoes and mushrooms work in most soups as well. Garlic becomes mild and even sweet when simmered in soup so add several peeled and chopped cloves if you wish. You can use ground meat or sausage in soup. Be sure to chop or crumble or meat into bite-sized pieces before adding it to the soup. Chopped pieces of boneless meat are a favorite as well. Cover ingredients with water, broth or a combination of broth and water. If boxed or canned broth has been opened and sat in the refrigerator for more than four days, give it a smell or toss it and start a new box. If you use water, consider adding bullion or add a spoonful of a concentrated paste like “Better than Bullion” which can live in the refrigerator for over a year. Add 2 tablespoons of an acid such as wine, apple cider vinegar or lemon juice. The right amount of acid will make the soup more flavorful, not sour. Let the soup cook for at least 30 minutes or until firm vegetables like carrots and potatoes become tender. Give it a taste before adding salt. If it needs to be saltier, add only ½ teaspoon at a time, give it a good stir and taste again before adding any more. Start your soup by placing chopped onion, mushrooms and two tablespoons of oil in the pot on medium heat and stir occasionally for 2-3 minutes or until the onions are translucent and the mushrooms brown. Then add your liquid and remaining ingredients. Add 1 tablespoon of dried herbs or ground spices to the pot and stir for a couple of seconds before adding the meat, broth and vegetables. I love Italian seasoning, which is a blend of thyme, rosemary, oregano and sage. I also like to use a teaspoon each of cumin, paprika and turmeric. Herbs and spices lose potency with time, so toss any seasonings that are over a year old and purchase small amounts of your favorites so they are used up before the go stale. If you wish to add uncooked brown rice and dense vegetables like potatoes, beets or carrots, add them immediately after you add the liquid since they will need at least 30 minutes to cook. Soak a cup of dried beans, lentils or quinoa in a quart of water overnight in the refrigerator to prevent gassiness and speed cooking. Drain and discard soaking water before adding them to the soup. If you want to make your own chicken broth, place a left over chicken carcass in a pot and cover with water. Add tablespoon of acid and simmer for at least an hour. You can also add a few peppercorns, a cinnamon stick or a bay leaf for more flavor. Strain the spices and bones before adding the broth. Pick remaining bits of meat off the bones and add it to the soup. Think of favorite dishes you can replicate in soup form. I like pumpkin curry, so I combine left over cooked winter squash, coconut milk and curry powder to make a soup. If you love Italian food, then tomatoes, basil, zucchini and garlic would be a good mix. Let strong flavored vegetables be the main focus of the soup. If you have beets, make borsht. This also goes if you want to use a lot of a particular vegetable. If you have lots of mushrooms, let it be a mushroom soup. Look online and in cookbooks for inspiration. If you have any leftovers, pour them into in wide mouth plastic containers allowing at 2″ of space if you plan to freeze them. Fluids expand when they freeze, and using a flexible container with extra space allowing this space will prevent the container from cracking. To cool leftover soup more quickly, fill the sink with 3-4″ of ice water. Place the containers in the ice water for 20 minutes. Move the containers to the refrigerator once they are no longer hot. Do not let soup sit out at room temperature for more than three hours or it may go bad. Once soups are completely cool they can be moved into the freezer. To thaw soup, place them in a pot of warm water. The wide mouth and allows the slightly thawed soup to slide out of the container and into a microwave safe bowl or saucepan to be reheated. Soup can stay frozen for over a month. 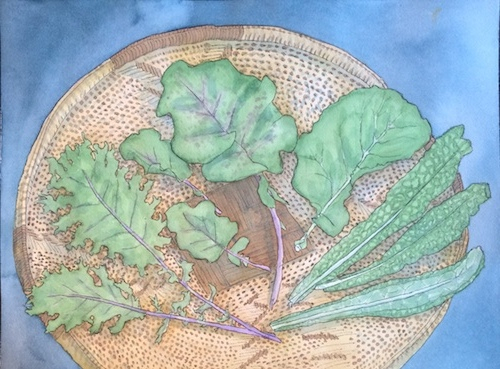 The varieties from left to right are: red Russian kale, tree collards- which are perennial and can be grown from cuttings, regular collard greens and lacinato kale. Not that raw kale, collards and members of the cabbage family are not recommended for people with thyroid issues. Try parsley instead. This is my favorite pick me up if I haven’t eaten enough vegetables lately. This recipe makes a LOT of smoothie, so I will usually share it with my husband and drink the remainder the next morning. Add only 2-3 leaves of kale the first time you make it and give it a taste before deciding to add more. Note that you need a fairly powerful blender to completely blend all of the ingredients. Prepare all the ingredients and put them in the blender. Fill the blender with water until the ingredients are half-submerged. Turn on the blender, starting at the lowest setting and slowly increase the speed. Let the blender go at the highest speed for several seconds or until the mixture is an even, light green color. Slowly decrease the speed and turn the blender off. Blending time will depending on the power of your machine. Pour a little bit of smoothie in a glass and taste it. If necessary, add more kale, apple or water and blend again until it is the smoothie is the bitter/sweetness/consistency you desire. Substitute kale leaves with collard greens. Collard greens are slightly less bitter and much larger than kale leaves. You can substitute kale for a handful of parsley or mint for a different flavor. For a sweeter smoothie, add 1 banana or 4 seedless grapes. 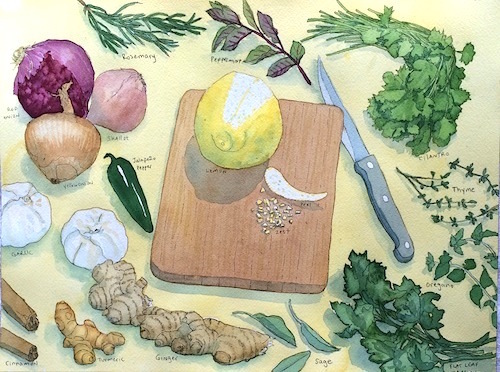 Herbs and spices are one of the easiest ways to make the food you cook more interesting. Just a spoonful of these aromatic plants will lend the flavors of the world to your meal. For example, the addition of basil, garlic and oregano will give almost any dish an Italian feel. The seasonings in most recipes are flexible, and I encourage you to to use the herb and spice descriptions below to find more appealing combinations. The aromatic oils in herbs and spices steadily evaporate and change with time, so it’s a good idea to buy herbs and spices from businesses that have high turnover to ensure they are still potent. If you have a bunch of ancient herbs and spices in your kitchen, toss them and start over with a fresh collection. A 1/4 cup of fresh seasonings should cost more than a couple of dollars, and you can focus on just a couple at a time and use them abundantly to get a solid sense of their flavor. If you can’t find good quality herbs in your area, two great online resources are www.penzeys.com or www.mountainroseherbs.com. If you have a sunny balcony or patio, many herbs are easy to grow in a bright corner in a pot. Mint can be invasive, and mint and basil need moist soil to thrive. Woody herbs like thyme, oregano, rosemary and marjoram are more drought-tolerant and only need water every other week or so, depending the temperature and the size of the pot. These herbs are native to the Mediterranean and need to be covered or brought inside if temperatures freeze. In addition to adding flavor to food, many herbs and spices are highly antimicrobial, and they are used abundantly in the food preservation chapter in this book. Herbs and spices are also utilized in many healing traditions around the world. While they can be beneficial, some herbs and spices may also be harmful for certain health conditions. While the amount of seasonings used in these recipes is very small and safe in most cases, you should consult your doctor, and research possible contraindications if you are taking medication, suffer from a serious health condition, or are pregnant. This book includes possible health benefits of certain herbs and spices based on studies and traditional herbal medicine, however this information is educational purposes only, and is not intended to diagnose, treat or cure illness. Herbs are essentially the leaves of aromatic plants. Juicy, green-stemmed herbs such as basil, cilantro and parsley can be enjoyed fresh, and as much as a ½ cup may be added to dish. More concentrated herbs with woody stems like thyme, oregano or rosemary are best used dried and used by the spoonful. All herb measurements in this book are for dried herbs unless otherwise specified. Substitute 1 tablespoon of fresh herbs for every teaspoon of dried if you wish, with the exception of rosemary, which you should use 1 tablespoon of fresh for ½ teaspoon of dried herb. Below are details about the herbs that appear frequently in the recipes in this book. Basil has a slightly sweet, licorice-like flavor. Basil is used in Chinese and South Asian cuisine, is used as a garnish in the Vietnamese soup known as pho, and is frequently paired with tomatoes in Italian cuisine. It can be used raw, cooked or dried, and it is an essential player in a dried herb blend known as Italian seasoning, which is used frequently in this book. Bay Leaf is a tough, leathery leaf which is often added whole to simmering broths and sauces and discarded before serving to give a sophisticated herbal flavor. Bay leaf tree is related to the tree that produces cinnamon bark, avocado, as well as the California bay laurel tree. Bay leaf is native to the Mediterranean cuisine but works well in a variety of dishes. Cilantro is used in Indian, Chinese, Thai and Mexican cuisine. The flavor diminishes when cooked, so it is often used raw in spring rolls, salads and in guacamole. Cilantro has a distinctive citrusy flavor, but it can taste soapy to some people due to a genetic trait. Coriander is the seed of the cilantro plant. Cilantro is in the same family as fennel, dill, carrot, parsnip, parsley, cumin and celery. Marjoram is closely related to oregano, and has a similar flavor, however it can be enjoyed fresh as a garnish without the bite. Fresh marjoram leaves are great mixed in salad and lends an Italian flavor to omelets. Marjoram is related to basil, mint, thyme and sage. Oregano gives a distinctive Italian hint to tomatoes, meat, beans and vegetables. Fresh oregano is very spicy and is best enjoyed cooked. Oregano is strongly antimicrobial. Parsley has a fresh green flavor that compliments red meat and is an excellent garnish for green salads and eggs. Parsley is very nutritious and a great addition to green smoothies. Peppermint is delightful in savory as well as sweet dishes. Add minced peppermint leaves to fruit salads, green salads and spring rolls. A sauce made with mint is traditionally enjoyed with roast lamb. Fresh peppermint is featured in the mint smoothie recipe. Rosemary has a pervasive smell and compliments gamey, hearty foods such as lamb, pork, poultry and potatoes. A sprig of fresh rosemary can be added to braised dishes and stews. A little rosemary goes a long way. Sage is a favorite herb for chicken and is used to season traditional Thanksgiving turkey and stuffing. It’s also used to season pork and bean dishes. Ornamental varieties of sage are popular in drought prone gardens, but are not recommended for culinary use. Thyme is wonderful in chicken soup and on broiled meat. Dried thyme is excellent mixed with ground turkey, which can be bland on its own. A study comparing the antimicrobial strength of 14 different herbs against common respiratory tract pathogens showed thyme essential oil to be among the top three most effective herbs, along with cinnamon bark and lemon grass. You might consider eating some chicken soup seasoned with thyme and drinking a cup of cinnamon tea next time you have a cold. Spices come from the seeds, fruit, roots or bark of plants and trees. Most spices tend to be hot, sweet, earthy, pungent or a combination of these flavors. Most spices can be purchased in either powdered or whole form. Cinnamon (bark) is both spicy and is naturally sweet without sugar. It can make foods more dessert-like or can add an interesting contrast to savory dishes. Sprinkle a little cinnamon on steamed winter squash, yams or hot cereal to make them more exciting. Cinnamon is featured in the preserved lemon recipe, which is fabulous on roasted chicken. It is easy to make a herbal teal by simmering a stick of cinnamon in two cups of water. Cumin (seed) is an ancient spice with an earthy flavor that is popular throughout the world, particularly in Middle Eastern, Indian and Latin American cuisine. Cumin is found in curry, is excellent in guacamole, and delicious on seared salmon. Add cumin to beans, lentils, meat and sautéed greens. Cumin combines well with garlic, turmeric and oregano. I tend to use cumin liberally and frequently. Coriander (seed) has a similar flavor to cumin, but has a lighter, more citrusy quality reminiscent of cilantro leaves. Coriander is found in garam masala, a traditional Indian spice blend, and can be used in meat rubs and sautéed dishes. Garlic (bulb) is a popular and powerful antimicrobial spice. It is used in sauerkraut and other fermented foods to prevent the growth of undesirable bacteria. Raw garlic can burn, so always dilute it with oil or avocado if you wish add it to dressings or dips. Add garlic, olive oil and salt to fruity vinegars for delicious meat glaze. Cooked garlic has a slightly sweet and flavor and is delicious in soups and hot dishes. Garlic is closely related to onion. Ginger (rhizome) is very hot, and is a common folk remedy for nausea. A quick ginger ale recipe is included in the beverage section. Fresh minced ginger and garlic add Chinese flavor to sautéed dishes. Boiled ginger makes a soothing, spicy tea for sore throats, and a piece of ginger in smoothies gives a nice kick. Mustard (seed) has a pungent, slightly nutty quality that is delicious in meat dishes and combines well with other spices. I particularly like powdered mustard with sautéed greens and garlic. Raw mustard seed is very hot, much like arugula, horseradish and wasabi radish, all of which are members of the cabbage family. The leaves of the mustard plant are edible and are also quite spicy. The yellow sandwich spread known as prepared mustard contains powdered mustard seed, vinegar and powdered turmeric. Paprika (fruit) is made from a variety of dried chili pepper, and lends sweetness and a beautiful red color to food. Certain varieties can be quite hot. Sprinkle a little paprika on guacamole, omelets and broiled fish or mix with other spices and rub on meat before cooking for color and flavor. Paprika combines well with most other herbs and spices. Smoked paprika is divine. Black Pepper (seed) or ground pepper is in not related to chili pepper, which is the fruit of a bushy nightshade. Black pepper is best freshly ground and added to food just before serving, often with salt. Whole peppercorns can also added to simmering broths in a spice ball for a distinctive kick. Turmeric (rhizome) is used medicinally to reduce inflammation, and is closely related to ginger. Turmeric is very pungent, and is best combined with other spices such as cumin and garlic, and is found in yellow curry and prepared mustard. Turmeric gives a distinctive tang to meat rubs, lentils and roasted potatoes and gives everything a golden yellow hue. Turmeric is usually sold as a powder, but it can also be bought as a fresh root, or “rhizome” which can be minced and added to food.